The Alder is a widely distributed deciduous tree growing to 20 metres or more. It may be found in damp areas, along rivers, banks and streams. It thrives in boggy ground. Alder is a productive timber tree and will grow quiet rapidly. The leaves are round or broadly oval with an indented tip and toothed margins. It has separate male and female catkins. The female catkins when ripe are brown and woody. These can help with identifying the tree in winter time. 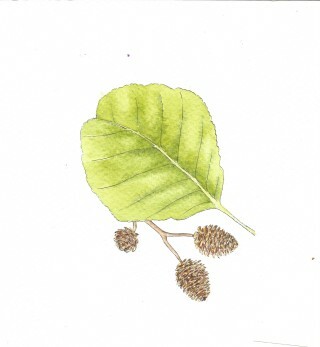 Folklore tells us that Alder timber was used to make shields for warriors going into battle. Alder timber is also known to be resistant to decay when submerged in water. For this reason, it was used to make sluice gates and other structures along streams, rivers and canals. Alder was also the chosen wood for making clogs which were popularly sold to the cotton mills in England.